Billiter’s canvas is a landscape with porch swings, grackles, rural roads too familiar with car accidents, and citizens with names like Uncle Ersel and Gethsemane. The town mentioned prominently is Shinbone (with a reference to taking the mail-train to Mobile, Alabama), though the imagination and knowledge of the young speaker (who spends much of his time dreaming and exploring with pals Willy, Stinky and Soup) takes him as far as Tierra del Fuego, the Red Sea, to the image of a Persian girl lifting her veil. Just knowing that this is not my last time to try takes a lot of the pressure off and allows me to sort of roll with the punches. Every magazine that decides not to cover SILVER SPARROW may very well come around for the next book. I am in this for the long haul. When I look at how far I have come in the last ten years, I understand what it means to really build a career. Baby steps are real progress. Award: Winner receives $1,000, publication by the University of Pittsburgh Press in fall 2012, 15 copies of the book and a feature reading. Eligibility: African American writers who have not had a full-length book ofpoetry published by a professional press. Authors of chapbooks and self-published books with a maximum print run of 500 may apply. considered, regardless of postmark date. ...readers of all stripes can always find a way into your work, unless they just don’t want to. So with Diwata, I had little apprehension about it being alienating; it was a non-issue. I told them there’s always a community of people who want to read our work, folks for whom the poetry is mutually resonant, and it’s just a matter of finding them. It was not a scorpion I asked for, I asked for a fish, but maybe God misheard my request, maybe God thought I said not “some sort of fish,” but a “scorpion fish,” a request he would surely have granted, being a goodly God, but then he forgot the “fish” attached to the “scorpion” (because God, too, forgets, everything forgets); so instead of an edible fish, any small fish, sweet or sour, or even the grotesque buffoonery of the striped scorpion fish, crowned with spines and followed by many tails, a veritable sideshow of a fish; instead of these, I was given an insect, a peculiar prehistoric creature, part lobster, part spider, part bell-ringer, part son of a fallen star, something like a disfigured armored dog, not a thing you can eat, or even take on a meaningful walk, so ugly is it, so stiffly does it step, as if on ice, freezing again and again in mid-air like a listening ear, and then scuttling backwards or leaping madly forward, its deadly tail doing a St. Vitus jig. God gave me a scorpion, a venomous creature, to be sure, a bug with the bite of Cleopatra’s asp, but not, as I soon found out, despite the dark gossip, a lover of violence or a hater of men. In truth, it is shy, the scorpion, a creature with eight eyes and almost no sight, who shuns the daylight, and is driven mad by fire, who favors the lonely spot, and feeds on nothing much, and only throws out its poison barb when backed against a wall — a thing like me, but not the thing I asked for, a thing, by accident or design, I am now attached to. And so I draw the curtains, and so I lay out strange dishes, and so I step softly, and so I do not speak, and only twice, in many years, have I been stung, both times because, unthinking, I let in the terrible light. And sometimes now, when I watch the scorpion sleep, I see how fine he is, how rare, this creature called Lung Book or Mortal Book because of his strange organs of breath. His lungs are holes in his body, which open and close. And inside the holes are stiffened membranes, arranged like the pages of a book — imagine that! And when the holes open, the pages rise up and unfold, and the blood that circles through them touches the air, and by this bath of air the blood is made pure . . . He is a house of books, my shy scorpion, carrying in his belly all the perishable manuscripts — a little mirror of the library at Alexandria, which burned. Kelli Russell Agodon has organized a Big Poetry Book Giveway for National Poetry Month! 63 bloggers have signed up to give away books. Click HERE for the list of bloggers. Yet Muñoz, who worked hard to move away from a life in the fields, is wary of labels. 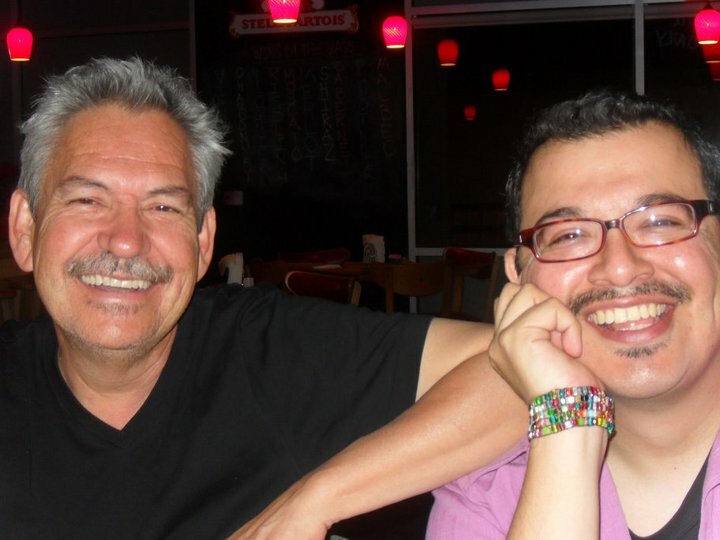 His debut novel, What You See in the Dark, published in March, is neither essentially gay nor Chicano. It marks his foray into the unfamiliar, cinematic world of 1950s Bakersfield, California—the tip of the Central Valley that he never saw growing up, that takes its cues less from the crops than from Los Angeles. i can't stop listening to this arthur russell song. i added a sentence to my bio. happy now, dan? ha. still no title for the book. well, there's one possibility. the more i think about this title, the more i love it. the other day i wrote down three lines. i think it's the beginning or the ending of a poem i've been carrying around in my head for months. hi, rodney gomez. are you ready for cantomundo? I workshopped those poems at Iowa and people loathed them. Dean Young, my dear friend, hated them with a passion. Cole Swensen my advisor, who is a wonderful poet and also a dear friend. She said ‘I must not be the intended reader for this work,’ I believe is what she said. It’s poetry’s uselessness that excites me. Its hopelessness. All this talk of usefulness makes me feel I’ve suddenly been shanghaied into the helping professions. Prose is practical language. Conversation is practical language. Let them handle the usefulness jobs. But of course, poetry has its balms. It makes us less lonely by one. It makes us have more room inside ourselves. But it’s paralyzing to think of usefulness and poetry in the same breath. i had a great time in el paso. it was a blast reading with carolina monsivais and barbara jane reyes. i didn't read well. i got nervous. my hands were shaking! i didn't make eye contact with the audience. brent goodman: closet high school girlfriend. and it was a pleasure meeting benjamin alire sáenz, sasha pimentel chacon, and daniel chacon. i read a couple of times at the macdowell colony and both times i did a good job. my voice was strong. i made contact with audience. i cracked a few jokes. in short, i was me. Enjoying dinner with Benjamin Alire Sáenz. 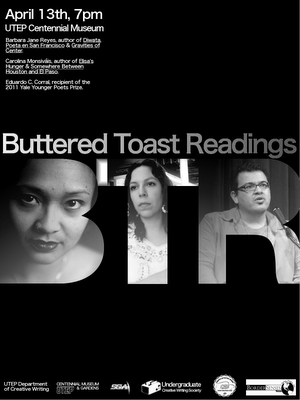 The University of Texas at El Paso (UTEP) Undergraduate Creative Writing Society's "Buttered Toast Reading Series" presents special guests Barbara Jane Reyes, Carolina Monsiváis, and Eduardo C. Corral. it never fails. i always get sick when i come back home. sore throat. runny nose. damn kids. ha. Carmen Giménez Smith is having a great week. She won a fellowship from the Howard Foundation of Brown University and her third collection won the Juniper Prize for Poetry. still no title for my forthcoming book. the search continues! here are some pics of my walk through the dark at the macdowell colony. i'm telling you: it got scary. right, cornshake? i would hear things moving about in the woods. i would see dark shapes dart across the path. in these pics i'm walking from colony hall to my room at the lodge. "Cross Over Water" is set to become a sentimental favorite of El Paso insiders who will recognize the many businesses and sites that have become institutions or cherished memories of the international border; but so too will outsiders appreciate an alternative path into a city that's been more closely -- and unfairly -- associated with conflict than with community. Rescue Press presents The Black Box Poetry Prize, a contest for full-length collections of poetry, open to poets at any stage in their writing careers. This year’s submissions will be accepted during the month of June, 2011. And what about the volta, or turn, which introduces the idea of transformation and change, of conflict and resolution, of restraint and surrender, of emotion and reason. The volta is like a soul in flux; it's my favorite part of the sonnet. i'm at the manchester airport. today was my last day at macdowell. i'm stupid. i forgot to leave my studio/bedroom keys at the front office. i noticed i still had them in my pocket AFTER i was dropped off at the airport. i called back the handsome man who gave me a ride and he was kind enough to loop back to pick them up. thanks, scott!!! two months spent in the woods. what a gift. the macdowell colony will always have a special place in my heart. it was my first colony way back in '06. and this time...i still get emotional when i think about it...forgive me...this time, during my first week in residence, i found out my manuscript had been selected for the yale series of younger poets. back to southern arizona for a bit. then a reading in el paso, texas. and then a month-long residency in new mexico. Well, I said I didn’t write on Facebook or blogs, I didn’t say I didn’t read them. Of course, I do. I like to be in the mix. I like to see how others comport themselves. I learn from the wise and the fools give me something to chuckle about at teatime. I received very little of that enthusiasm from the queer community, whether from bookstores, review outlets, or academics. So I chose to hear the silence for what it was. I did my best to move in the community that was receiving me openly and without equivocation. Queer lit, at best, was a mixed bag—I’ve been very honest about that for some time now.